One of the tool displays at our exhibition last weekend (see previous post) was by ECCENTRIC ENGINEERING. 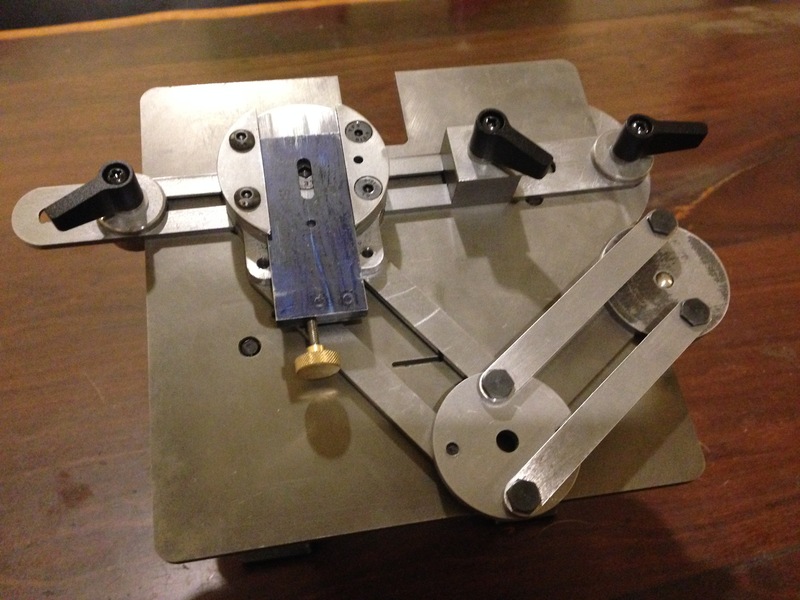 Eccentric Engineering is well known for the Diamond Tool Holder, which is a favourite lathe tool holder for most of us who use metal working lathes. 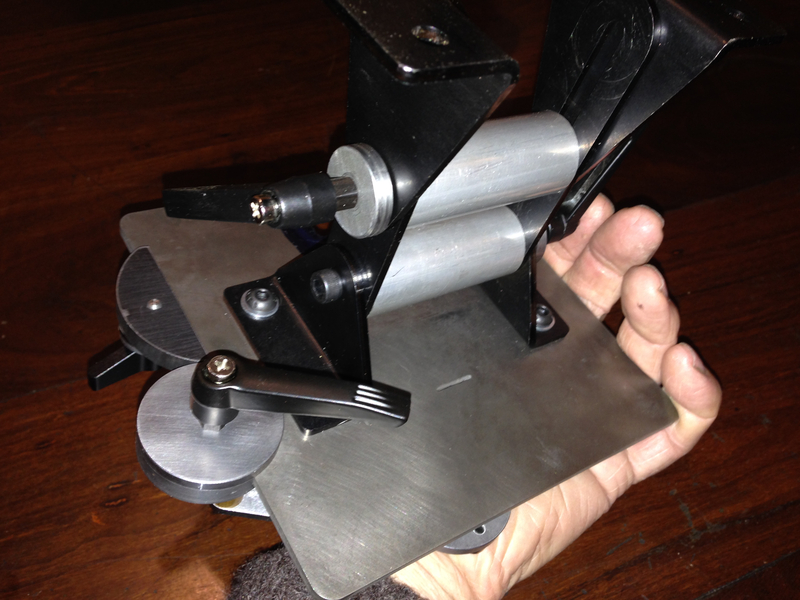 However I was more interested in Gary Sneezby’s (Owner-engineer of Eccentric) new tool, which is a tool sharpening system for use with a bench grinder, named “The Acute Tool Sharpening System”. Gary demonstrating the Acute Tool Sharpening System at the GSMEE exhibition. 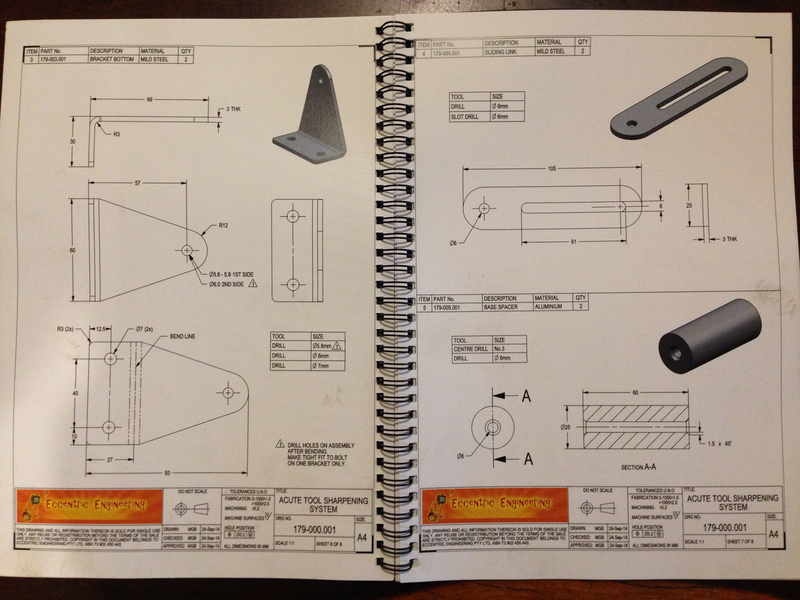 The Plans and assembly diagrams, in a bound booklet. The system is available as a complete working unit, or a kit of semi machined parts and plans, or plans only. I bought the kit of semi machined parts, and the booklet of plans. Cost (show price, no postage) $AUD250. This is an excellent price for the 50 or so laser cut parts, quality die cast handles, all fasteners, Allen keys, detailed plans. 2 of the 33 pages of plans and diagrams. The plans are excellent. They are clear, easily read, and large. There are no instructions, but a DVD is planned. Gary is contactable by phone for construction advice, if needed. After 4 half day workshop sessions I am well into the construction. The laser cut parts are accurate within 1mm, and drilling points are accurately centre drilled. Gary pointed out that the drilling points are more accurately positioned than the laser cut part perimeters. That necessitates drilling centre holes (and the other holes) and using a mandrel to enable accurate turning of circular components. He also advised that HSS cutters be used in preference to carbide tipped tools. I found the parts to be very closely dimensioned to the finished parts. The table top measures 150x150mm, and I found the flat hardened steel to be mildly bowed, to the extent of 0.38mm. That is probably due to heat distortion from the laser cutter. Some attention on the press straightened out the plate to less than 0.05mm bowing. I might touch it up on the surface grinder, but that is probably unnecessary, given the way the system functions. I had a machining accident with one part. It is useable, but will need to be replaced. I rang Gary, and the new part is in the mail. Now that is service. The sharpening system is starting to look serious. 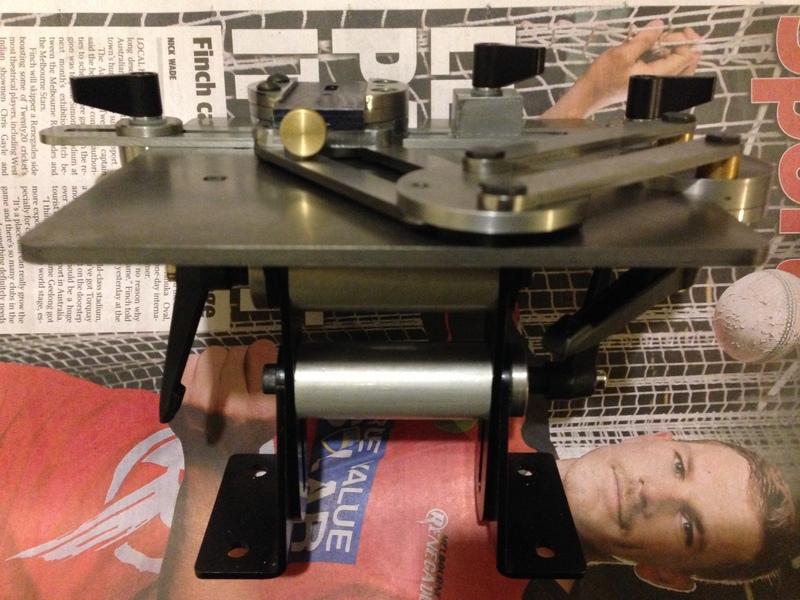 It consists of a base, top plate which is adjustable for tilt and height, parallelogram arm, slide and toolholder. It looks interesting. Not sure how it works yet (Much clearer since watching the YouTube video at the end of this blog). Still some parts to be made-machined. The notch at the top is where the grinding wheel fits. The underside. Nice use of O rings to lock the adjustments into position. The cast handles are good quality. Another session or two in the workshop should see this project completed. I will report on how it performs in a week or two. I expect that it will be a lot quicker and simpler to use than the Quorn. Watch the YouTube video by Gary to see how it works. Have you seen a similar thin g by Harold hall? Hi John, I have made 2 of Harold Hall’s tool rests, and they are very clever and intricate, but a bit fiddly in use. I expect that the Acute System will be the one which I use mostly now. The double parallelogram arms are the big improvement. Time will tell. I will report soon. John. sorry, I do not understand. I am a dumb monolingual Aussie. You do yourself an injustice. Apart from Aussie your English is very good as well.